Watch artists of all levels – beginner, intermediate, and advanced – sculpt “ice-terpieces” out of blocks of ice. Starting at 9am, carvers will start chipping and melting the ice to create an original sculpture. Carvers will be outside of the several Sturgeon Bay businesses competing for cash prizes. In addition to ice carvings, professional carvers will be turning giant snow blocks into masterpieces. These snow sculptures will be scattered throughout the city. Be sure to pick up a Fire & Ice brochure for a listing of the 20+ snow and ice block locations. Also included in the brochure is a People’s Choice Award ballot. You can find the Fire and Ice brochure here. Cast your vote for your favorite ice block and drop it off in the Sturgeon Bay Visitor Center office (36 S. 3rd Ave.). Winners are announced at 3 pm at the Sturgeon Bay Visitor Center. But before you vote, be sure to take a trolley around to see all of the sculptures. 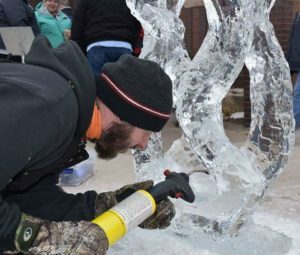 If you are interested in participating in the ice carving competition, please fill out the ice carver application. Go from one ice and snow sculpture to the next by trolley! Tour Sturgeon Bay in style by taking a free Door County Trolley ride from 10:30am-2:30pm. Trolley stops will be marked on the Fire & Ice brochure. The Door County trolley will make loops around the city so be sure to hop on and go for a ride. Happening in Martin Park from 10am-noon and 1-3pm is Fire on the Ice. Watch professional blacksmith, James Viste, forge metal and turn metal rods into something special. Attendees have the chance to forge their own metal projects too! If you’re needing a place to warm up on the chilly day be sure to stop by Martin Park and check out the excitement. For more information about the daytime activities, please email vacation@sturgeonbay.net or call (920) 743-6246. After a day outside admiring the ice sculptures, dance the night away in the beautifully decorated Stone Harbor Resort ballroom at the annual Fire & Ice Gala, beginning at 6pm. This popular black-tie optional dinner and dance is Door County’s event of the winter. Dress up and enjoy cocktails, dinner, dessert, live and silent auctions, and live entertainment by Hip Pocket, a powerful band with a blazing horn section, rocking rhythms, and amazing vocals. **UPDATE: The 2019 Fire & Ice Gala is sold out. For additional information or if you wish to attend the 2020 Fire & Ice Gala, please call the Sturgeon Bay Visitor Center at (920) 743-6246 or email vacation@sturgeonbay.net.